Yet another new trooper joins us this week. 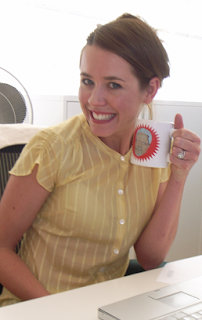 Meet Siobhann (I know, easy to say, difficult to spell, a bit like chrysanthemum) and she's a wonderful account manager who has come to us by way of JWT (yes, they are still in business) and Bates (no, they are not still in business). Siobhann (doesn't get any easier no matter how much you write it) originates from somewhere is Western Australia which means she can wrestle crocs, drink 24 tins of beer in one sitting, and shoot the eye of a roo out at 100 paces. Actually, I made all that up and I'm ashamed of myself. She actually rides a portbale-foldable-bendable bike thingy and wants to learn how to play the banjo. Yee haa. Welcome Shieobauhn ... oh bugger it!